No two places on the planet have exactly the same soil, although sometimes similar types of soil can cover large areas. Plants growing in a particular place have adapted over millions of years to the local soil, so when we plant them in different soil in our gardens, it’s can be a challenge for them. Certain areas have ideal soil for certain kinds of plants, so they grow well, while others are less successful. Since soil is so important to plants, knowing the soil you are gardening on is a first step to learning how to choose the right plants for your garden. You will often see, when reading a plant description, that it grows best in one or another type of soil, so if you know your own you can choose wisely, and be successful. Its better to choose plants that will do well, and thrive, than struggling to grow a plant in soil that it doesn’t like. Even if you have some snow on the ground right now, if you can dig up a handful of soil and bring it inside to thaw, this time of year is a good time to learn more about your soil. When you start buying plants in spring you can make smart choices. This is, literally, how your soil ‘feels’. But underneath that, it is a measure of the size of the particles in it. Soil is made by the slow wearing down of rocks. Heat and cold, rain and drought, flowing water, and other environmental factors grind down boulders into smaller and smaller pieces. These are moved around by gravity, wind and water, until they accumulate and become soil. Although every piece of rock in your soil is a different size, we divide them into just three groups – sand, silt and clay. Sand is the gritty pieces, that make your soil feel rough. Silt are finer particles, that feel silkier. 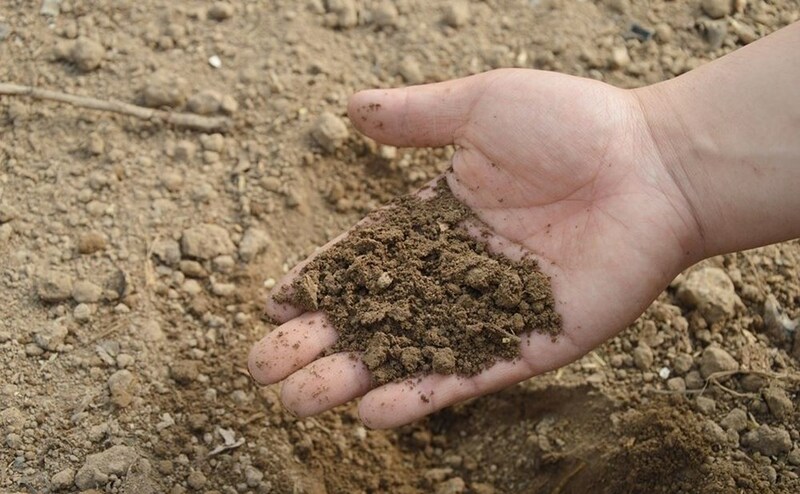 Clay is the tinniest of all, and makes your soil feel sticky. Pieces bigger than 1/16th of an inch don’t count – they can affect drainage, but not your soil type. Depending on the proportion of each of these particles, the properties of your soil will be different. Sandy soils dry very easily, and have few nutrients. Clay soils stay very wet, but are often rich in plant foods. Farmers and gardeners have a special name for soils that are have roughly equal amounts of these particles – they call them loam soils. ‘Loam’ is not a thing, it’s a name for a balanced type of soil. You can find out the texture of your soil easily. Scrape off the top inch or two of your soil, and take a handful. Remove any twigs, stones and pieces of gravel, and fill the palm of your hand. Add a little water and mix it together until you have a ball of soil. You want it to hold together, but not stick to your fingers. Put the ball between your thumb and first finger, and slide your thumb across it to push out a ribbon. Try to make it thin, and about ½ an inch wide. Measure how long you can make it, before it breaks up and falls. If you can only make a ribbon about ½ long, and the soil is crumbly and falls apart, you have a sandy soil. If it holds to about 1 inch long, you have a loam soil. If the ribbon grows to almost 2 inches, you have a silty kind of soil. If it grows more than that you have clay soil. The longer it grows, and the more like Playdough it feels, the more clay you have. Notice too how smooth or rough the soil feels. The rougher the feel, the sandier your soil is. You can find more details on doing this test here. You will find the names of intermediate kinds of soil, such as ‘sandy loam’, or ‘silty clay’, as well, but for most gardeners a general idea is all you need. This is an important measurement, since many plants need soil of different values. It is a measure of how acid or alkaline your soil is, and that in turn affects which elements are available for plant growth. Although some old-time farmers can tell this by literally tasting a little soil, for the rest of us the best way is to pick up a simple test kit or probe at a garden center and follow the instructions. We measure pH on an odd scale. The number ‘7’ is neutral, while lower numbers are more and more acidic. Numbers above 7 are more and more alkaline. The ideal number for most plants is 6.5. That is when the maximum amounts of the useful elements are available to your plants. Some plants, like azaleas, rhododendrons, gardenias, and camellias prefer more acid soil – around 5.5 or even lower. If you have that kind of soil, you can enjoy all those lovely plants. If you don’t, but love them anyway, the easiest thing is to grow them in pots, using a soil-mix for acid-loving soil. If your soil is a rich, dark brown, then it probably has lots of organic matter in it. Light-colored or reddish soils, especially if they are also sandy, are often low in organic material. Soil that has been pasture land will often be rich in this important material, which comes from the decay of plants. Almost all gardens could use more, so always add organic material to your soil when planting, and use it as mulch over your beds too. Its far better than chemical fertilizer, since it makes your soil healthier, while also feeding your plants. Most plants don’t like to sit with their feet in water. They need air around the roots, and this is pulled into your soil as water drains away. To test your drainage, choose a spot that you haven’t dug over for several months. Dig a hole about a foot square and a foot deep. Do this when it hasn’t rained for a while. Fill the hole quickly with water from a bucket. How long does it take for all the water to drain away? If it is less than 10 minutes, then you have very fast-draining soil, and drought is going to be a problem for you. Add lots of organic material, water regularly and choose drought-resistant plants. If it takes between 10 and 30 minutes to drain, this is ideal, and is the ‘well-drained’ soil you see recommended for most plants. Enjoy growing a wide range of trees and shrubs in your garden! If it takes an hour or more, then you have poor drainage. This can be improved by digging and adding plenty of coarse organic material. If it takes several hours, then you may need to install drainage tile to be able to grow most plants. Now that you have done these simple tests, you know much more about your soil. Now you can learn how to improve it, and which plants will grow best in it. Adapt your garden to your soil, while also trying to improve it over time. There are plants that will grow in almost any kind of soil, and you can have a great garden, now that you know the basics.